The Largest Digital Camera In The World Takes Shape : The Two-Way A two-story tall, digital camera is taking shape in California. It will ultimately go on a telescope in Chile where it will survey the sky, looking for things that appear suddenly or change over time. A technician examines the mirror on the Large Synoptic Survey Telescope. 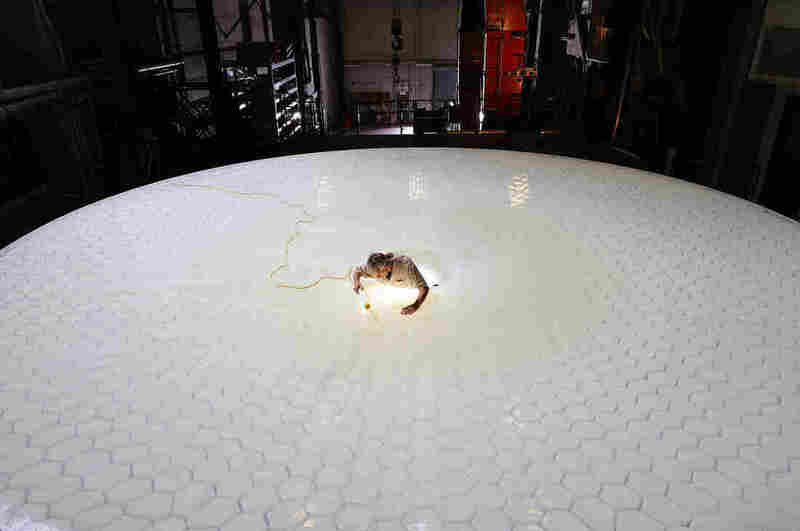 Scientists at two national laboratories are currently building the components for an enormous digital camera that will capture images from the telescope. Astronomers in California are building the largest digital camera in the world. It will go on a giant telescope taking shape in Chile called the Large Synoptic Survey Telescope. LSST is different from most large telescopes. Instead of staring at a tiny patch of the sky and taking essentially one snapshot in time, LSST will take a panorama of every part of the sky...and it will do so over and over and over. The idea is to see what's moving or changing in the heavens. "That could be everything from asteroids, to variable stars, to supernova, to maybe new phenomenon that we don't know about yet," says Aaron Roodman, a physicist at the SLAC National Accelerator Laboratory. Roodman is the scientist in charge of the integration and testing of the camera. Final assembly will take place at SLAC, and is still two years off. "Right now, every piece of the camera is under construction in various places," says Roodman. The sensors that will actual capture the light from stars are being assembled at Brookhaven National Laboratory. Lawrence Livermore National Laboratory is shepherding the construction of the optical lenses. A device for putting different color filters in front of the camera lens is coming from France. All these parts will come together in two-story tall clean room that was specially built at SLAC for the two-story tall camera. "Clean room procedures are pretty common for working with CCD cameras," says Roodman. "A piece of dust on any of those surfaces, we'll really notice. It'll actually have a significant negative affect on the camera." Roodman offers to take me inside the clean room. You can't just walk into a clean room. You have to put on gloves, a hat, booties and an extremely clean white coveralls. Fully garbed you look a bit like an Easter Bunny. Once inside, Roodman points to a small box with cables coming out of it sitting on a lab bench. "All by itself this little unit is a 144-megapixel camera," he says. That's six times more megapixels than a high-end digital camera. There will be twenty-one of these boxes in the camera. Now for the camera to work properly, and make sure all the stars it sees are in focus, everything in the camera has to be in exactly the right place. Roodman says they have to measure things to an accuracy of two microns. That's about a twentieth of the thickness of human hair, depending, of course, on how thick your hair is. Not all the preparation and testing of the camera is super high tech. At another test bench, some graduate students are trying to make sure that the interior of a dark box is completely dark, and they're having a problem blocking out the glare from some LED lights mounted near the box. Roodman suggests putting some black tape over the lights. Then he laughs. "This is the beauty of experimental physics," he says with a chuckle. "On the one hand, I'm interested in studying the makeup of the universe. But for today, we've got to make sure that the tape is blocking out all the light from some LEDs." Roodman expects by 2020 astronomers should be able to start using his camera to study the makeup of the universe—presumably without the need for black tape.